Happy Thanksgiving and hoping that all you fashionistas are having a wonderful Thanksgiving day with your family and friends. Soon we'll all be having Thanksgiving dinner, the turkey, pumpkin pie and mash potato, but no doubt through all this you'll be thinking of shopping!!! After all, tomorrow is Black Friday, the biggest shopping day of the year and this is followed by the big online shopping day, Cyber Monday, the Monday following the Black Friday weekend. Many say that Cyber Monday has become an even bigger shopping day and that major retailers can be expected to offer their best deals with even bigger discounts on this day. Either way, Thanksgiving, Black Friday and the weekend, followed by Cyber Monday is the time that retailers will offer the best deals and prices you will see possibly for the next six to twelve months. Some of us will be hustling through the boutiques and local malls while others will spend their time online surfing the web for that perfect gift and of course there are sales on just about everything you can think of and usual favorites include the latest technology and electronics products. However, as well as the latest techno gadgets, it's a great time to shop for designer clothing and perhaps that pair of shoes and that special handbag that you’ve been thinking about all year. When it comes to fashion, here we will progressively list our best finds over Thanksgiving, Black Friday and the weekend through Cyber Monday. Enjoy 20% off of the entire site including both Donna Karen New York and DKNY on Cyber Monday plus free standard ground shipping. Enjoy 60% discount off all items with code Holiday10 at Lewis Cho plus FREE Shipping. Sale starting Cyber Monday, 11/29 at 9am EST and ends Tuesday, 11/30 11pm EST. Psst!!! For 6 hours only go Early Bird Special at Chinese Laundry and take 10% off any item, 20% off any 2 items and 30% off any 3 items with No Exclusions! But here's The Big Shabang! 10 Hours Only! $20 Off All Boots, $10 Off All Shoes Chinese Laundry! Excludes Clearance. But wait, there's more!! It's now deals after dark! Enter code BF$302010 at checkout to get $30 off any purchase over $100. Here's a great Cyber Monday Deal..... Use coupon code MANICMONDAY and enjoy 25% OFF the entire site at Lauren Merkin. Coupon expires December 15, 2010. Here's another BIG Shabang!! 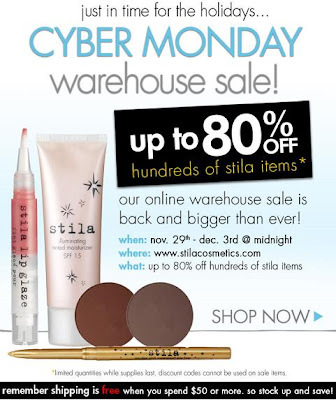 Bag Up To 80% OFF hundreds of stila items available at the Stila Online Warehouse Sale open for business from Cyber Monday, November 29 to December 3 at Midnight. And remember, shipping is FREE when you spend $50 or more, so stock up and save!!! On Cyber Monday, for One Day Get 20% Off Everything! Shoes, Bags, Jewelry, Most Wanted... with code CYBERMONDAY2010 at Moxsie. Another fave of mine...perfect gifts for those on your list. Enjoy 30% OFF sitewide for 48 hours at Jane Marvel. Just enter coupon code DOW30OFF at checkout. For Cyber Monday take $50 off $150 or more plus FREE Shipping on any order at Rachel Roy. Visit Paige Denim on Cyber Monday and take 15% off any 2 bottoms with code CYBER15, 25% off any 3 bottoms with code CYBER25 and 25% off all leather jackets with promo code LEATHER25. The Thanksgiving Sale at Brooks Brothers Factory Stores has been extended over Cyber Monday, November 29. Enjoy 40% off your entire purchase, everything in the store at Brooks Brothers United States Factory and "346" Brooks Brothers stores until the close of business hours on Cyber Monday. Visit Christian Audigier online on Cyber Monday between 5am and 11am and take 30% off, 20% between 11am and 5pm, and 15% off any time between 5pm and midnight on Cyber Monday. Sale applicable on both full price and sale items. It's the same deal at Ed Hardy. So shop early for maximum savings with these Cyber Monday Sale! Did you miss Cyber Monday? Shop Cyber Tuesday Instead! The entire Wilsons Leather site is Up TO 70% OFF original prices!. Plus get Free Shipping No Minimum Purchase! Save 25% on your entire purchase this Black Friday weekend at Emily Grace. Shop both new arrivals and sale markdowns and save 25% on your entire purchase with code THANKS25 through Cyber Monday, November 29th. Save 20% on most items throughout the week of Thanksgiving at Shabby Apple with code THANKSGIVING at checkout. From 10am on Black Friday, November 26 through 10:00am (ET) on Cyber Monday, November 29 enjoy 30% OFF selected models at the Mackage, online store. Into top designer fashion? Enjoy a discount of 30-50% on handbags, shoes and apparel from such designers as Valentino, Alexander McQueen, Theory, Stella McCartney, Lanvin, Halston and more at ElyseWalker.com!!! I love the Givenchy, super chic Robes San Maches dress at 50% OFF. Latest Update: Cyber Monday sale online at ElyseWalker.com - 50% off + free shipping when you enter code CYBERMONDAY at checkout. At Planet Blue enter promotional code SURPRISE20 at checkout to receive 20% off your entire purchase excluding sale merchandise through Cyber Monday, November 29 at 11:59pm PST. Also check out the 75% OFF Sale merchandise. From Black Friday, November 26th through Cyber Monday, November 29th, enjoy 20% OFF select dresses, casual jackets, jeans and shoes PLUS Free Shipping at Topshop. Fall Sale up to 40% OFF at French Connection US plus FREE Shipping on orders over $125 with promo code FCBFFS. Offer ends Cyber Monday, November 29. For two days only use promo code MERRY10 at checkout and enjoy 20% OFF your entire order at Ellington Handbags, creators of casual-chic women’s bags, purses & travel accessories in fine leathers and fabrics. This great sale runs from Cyber Monday, November 29 at 12.01am to Tuesday, November 30 at 11:59pm PST. Use code Cyber2010 to enjoy 20% OFF your entire purchase all day Cyber Monday, November 29th plus get an extra 5% off your order between 12pm EST at Eberjey. Offer ends November 29th at 11:59pm EST. Psst!!! 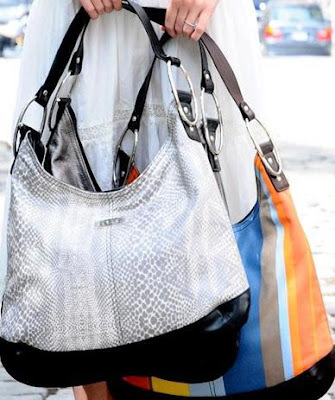 It's 60% discount off online handbags and automatic enrollment to the Junior Drake VIP. Save 25% for 24 hours only at Magnums.net with promotional coupon code CyberMon at checkout from Midnight Sunday to Midnight on Cyber Monday, November 29. Psst... Here's a great Thanksgiving Sale. Take 30% OFF ALL clothing and shoes in-store and online at OAKNYC.com PLUS, for a Super Deal for Thanksgiving Saturday, November 27, 6am- 2pm EST, oak jeans, a.ok sneakers and sweats will be 1/2 price or less at OAKNYC.com!!! Update: 6am to 12pm Sunday November 28, Torque Tees, Chinos, Leggings 1/2 price and 6am to 12pm Cyber Monday, November 29, Oak Sweaters $98. Shop for the Holiday and Save All Weekend at Kooba. Get 20% OFF when you enter code shop at checkout from Black Friday November 26 at 12:01am through Cyber Monday, November 29 at Midnight. Take 25% off your purchase plus free shipping through Cyber Monday, November 29 at Steve Madden with promotional code THANKS25 at checkout. Certain EXCLUSIONS apply and clearance is excluded from this promotion and free shipping. Update: From Black Friday Night, take 30% off your purchase with promotional code THANKS30 at checkout plus free shipping through Cyber Monday, November 29, at 11:59pm EST. Latest Update: Use code CM35 for 35% OFF and FREE Shipping. Ends 11:59PM EST. Use code LUCKY20 to enjoy 20% OFF your entire purchase starting at Midnight on Sunday 28th and ending at Midnight on Cyber Monday, November 29th at Piperlime. Online exclusive, Sunday 28th and Cyber Monday, November 29th, Cyber Monday Promotion Sale 30% OFF on Fall Winter 2010 collection at Diesel.com with promotional coupon code CYBERDIESEL at checkout. 3 Day Online Event Save 15% on your entire order at Brooks Brothers from Thanksgiving Day, Thursday November 25 through Saturday November 27, 2010, until 11:59 pm Eastern Time. Use code BLACKFRIDAY for 25% OFF sitewide at 80's Purple through Cyber Monday, November 29 PLUS all orders placed from November 24th, 2010 12:01 AM PST through November 25, 2010 11:59 PM PST, will receive a $10 gift card with ANY purchase. Gift Cards can be transferred but must be redeemed before January 31st 2011. The Black Friday Online Sale at Rebecca Minkoff starts at Midnight tonight and ends on Cyber Monday, November 29th at 11:59pm EST. Use promo code THANKS2010 and take 25% OFF your entire purchase at eModa.com all week long. Update: Use code BLACK2010 for 30% through Cyber Monday, November 29. Take 30% OFF at stefaniBags.com with promotion code BLACKFRIDAY through Cyber Monday, November 29. From 12am EST on Black Friday, November 26 through 11:59pm (PST) on Cyber Monday, November 29 enjoy Up To 75% OFF at the Rock and Republic, Black Friday-Cyber Monday Sale. Enjoy 30% OFF all purchases plus FREE Shipping at Emily Elizabeth Jewelry from Black Friday, November 26th to Cyber Monday, November 29th with promotional code BLACKCYBER. Shoes, shoes and more shoes. A woman can never have enough hey!! From 9am to 10am get 20% OFF everything at Peter Kate Shoes and from 10am to 5:30pm the offer is 15% OFF everything when you shop with a friend (some exclusions apply). As well as being able to buy shoes, handbags, jewelry and accessories at 15% to 20% OFF on Black Friday, I hear that Coffee and Puff's famous Christmas Cookies will also be served!!! Little Research Group (LRG) is offering 47% OFF select items on Black Friday, November 26 and now also on Cyber Monday, November 29. Use code WINTER20 to enjoy 20% OFF sitewide now through Cyber Monday, November 29th at 525America.com. Take advantage of this Best Ever, 25% OFF Sale with promo code CYBER10 at Yumi Kim on Cyber Monday. Plus enjoy free shipping on orders over $100. The good news is that the Black Friday Frenzy at Betsey Johnson has been extended one more day!! Take 40% OFF your entire purchase online now through Cyber Monday, November 29 at Midnight ET at Betsey Johnson. Plus enjoy free holiday shipping on all orders on Cyber Monday. This offer is valid on all Full Price and sale merchandise! It's 20% OFF your entire purchase in-store and online now through Sunday, November 28 with code THANKS20 at Cole Haan. At Stila Cosmetics on Black Friday only you can receive the ultimate party look set filled with stila best sellers for FREE (a $104 value) when you spend $50 or more (while supplies last) plus FREE shipping on your entire order. Use code BLACKFRIDAY. Plus check out the Stila Holiday Gift Guide with Up To 75% OFF at stila. Today Only! In stores and online Victoria's Secret ! Spend $60 or more on qualifying merchandise and get a free Supermodel Tote fileld with beauty must-haves. One free bag per order. CONTENTS: 2.5 oz. Dream Angels Heavenly® Mist, 4.2 oz. Secret Garden Lotion in Love Spell®, and full size Beauty Rush® lip gloss in Candy Baby. Dimensions of bag are 21.5" L x 13" H x 6" W. Enter offer code VSFRIDAY10 at checkout. Valid through 11:59pm EST on Black Friday, November 26, 2010, while supplies last. Take an Extra 25% Off your Entire Purchase with coupon code BLACKFRIDAY at celeb fave boutique, Shop Rumor through Sunday, November 28. Plus free ground shipping on all orders over $150. Enjoy up to 80% OFF Thanksgiving Blowout Sale through Saturday, November 27 at 9am PST at Tobi plus take 30% OFF regular priced items with code THANKS30. Latest Update: The 30% OFF Regular Priced items offer with code THANKS30 has been extended to Cyber Monday. Now ends ends November 29 at 11:59pm PST. ALDO is offering an Extra 30% OFF all reduced footwear & handbags. This includes all SALE & Clearance boots, shoes, sandals and handbags. Prices displayed reflect this additional discount. This offer is only valid in the U.S., online and in stores through Sunday, November 28th, 2010. ALDO is also offering FREE Standard Shipping on all online orders. Latest Update: Extra 30% OFF Extended!! Online Only for Cyber Monday at ALDO take 30% off all reduced footwear and handbags including all sale and clearance shoes, boots, sandals and handbags! It's 30% OFF Sale on Black Friday, November 26th at Satine Boutique. Thakoon, Erin Fetherston, Alexander Wang and many more. Enjoy 40% OFF your entire purchase until noon on Black Friday, November 26th with code BR40FRIDAY at Banana Republic. Offer valid on Banana Republic merchandise on November 26th from 12:01am through 12:00pm ET at Banana Republic stores and online. Take an EXTRA 40% Off Fall Sale and Clearance, saving up to 75% off original prices Plus, receive FREE Shipping with ANY order from Thanksgiving Day, November 25 through November 28, 2010 at C & C California. Use code TDAYX40 at checkout. Latest Update: Use code CCX40NOV and take an EXTRA 40% off your entire order + FREE Shipping with any order, one day only, Cyber Monday, November 29 at C & C California. Black Friday Sale at Aster Alice Boutique starts at 11pm EST on Thanksgiving Day. Save 30-60% off. Here's the latest update: take 40% OFF all new arrival handbags with code FRIDAY40, an Extra 40% OFF on all instock sale handbags with code FRIDAY40 and 30% OFF Everything else with code FRIDAY30. Shop early for the best selections. Shop late for the best savings!! Get 30% OFF the everything at Chico's Boutiques from Noon to 6pm on Black Friday, November 26th. Happy Turkey Day from Lindsay Lou! Save 35% OFF Everything (some exclusions apply) with code gobble now through Sunday at Midnight plus FREE ground shipping. Black Friday, Saturday and Sunday enjoy 25% OFF all purchases over $150 online at Vionnet Boutique with code THANKFUL. Latest Update: The first 30 shoppers to shop with code CYBERMONDAY get 30% Off their entire order! Psst... ShopCoclico.com Secret Sale!!! Email list insiders can use promotion code pumpkin for 25% off through Sunday November 28. This is your chance to score a deal on shoe styles that will not go on sale for a looooong time. The Black Friday online sale at HELLZ starts at 12am Friday night and this year, some extra exclusivity has been added to the HELLZ Black Friday sale. Never before seen samples, as well as some limited edition styles will be available for the pickin', while rare elusive HELLZ collectives will be of limited supply. For the most part, everything in the online shop this Friday will be "one-of's", so shop fast! For Black Friday The Body Shop has a great "3 for $30" offer online and in-store across the entire store excluding prepackaged gifts and kits. Also check out the lovely "Joy in a Bag" offer for only $25, a value of $175, when you spend $30 or more. Sadly, this offer is only available in-store. 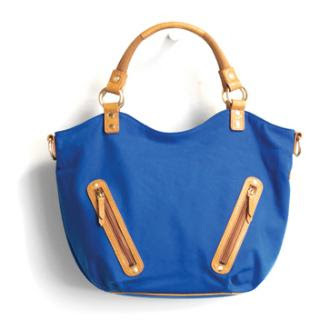 It includes a tote bag (value $25) including products with an aggregate suggested retail price of $175. The Body Shop's Black Friday "3 for $30" Offer is valid online from 3am EST November 25 through to 3am EST November 27 and in-store during store hours from November 25 to 26, 2010. Note that certain conditions and exclusions apply. Lord & Taylor have a number Thanksgiving and Black Friday offers. What caught my eye was the 25%-40% OFF Designer Handbags including DKNY, Cole Haan, Kate Spade New York and Harajuku Lovers; Extra 40% OFF already reduced shoes and 50% OFF all AK Anne Klein boots and booties; 50% OFF outwear, topcoats and raincoats; 50% OFF reduced sportswear, dresses, suits, intimate apparel and coats, and finally, 15% OFF storewide and extra 25% OFF fine jewelry with in-store savings pass or online promo-code THANKS. Enjoy 30% off sitewide plus an additional 30% off sale items on Cyber Monday with code CYBER30 at ShockBoutique.com. This offer ends at midnight PST. Get 30% Off Fall/Winter fashions at Creatures of Comfort. One definitely to check out is the 25% Off Thanksgiving through Cyber Monday Sale on Theory merhcandise at Theory.com. That's 25% OFF on coats, tops, dresses and more in-store and online from Black Friday, November 26 to Sunday, November 28 at 11:59PM EST. Use promo code ITSHERE at Theory.com (I love the Theory Ingrid jacket a seen sworn by Jennifer Aniston. At the SSENSE Black Friady sale happening now until Sunday, November 28 at midnight EST it's 30% OFF sitewide with promo code NOWORNEVER on fashion from sylish cocktail dresses by Lanvin and Alexander Wang to super cool outwear by Shades of Grey and G-Star. Exceptions apply. Update: New items have been added and offer now extended to cover Cyber Monday. The 30% offer at SSENSE extends to Wednesday, December 1st. Black Friday Sale - Get 30% Off All Outerwear online and in-store at 330 Bowery Street, NYC 10003. Enjoy 25% OFF your purchases of two or more jeggings at Paige Denim with promo code JEGGINGS25 at checkout. For now, enjoy your Turkey and best of luck with your shopping. Once again wishing you and your family a very happy and safe Thanksgiving! Nice information. Brothers Factory Stores has been extended over Cyber Monday, November 29. Enjoy 40% off your entire purchase, everything in the store at Brooks Brothers United States Factory and "346" Brooks Brothers stores until the close of business hours on Cyber Monday. Thanks for sharing..